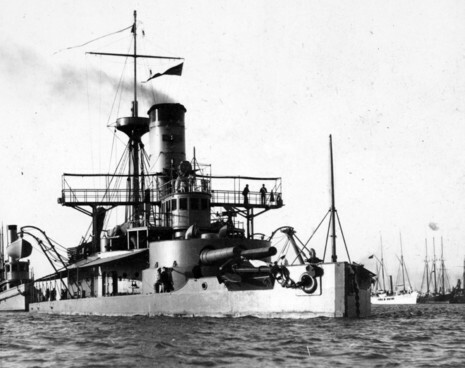 On August 1, the USS Puritan under the command of Captain Frederic W. Rodgers, was sailing by the coastline of the city of Fajardo, when Rogers noticed the "Faro de Las Cabezas de San Juan" (Cape San Juan lighthouse) which was supposed to be the landing site for the US Army in Puerto Rico. Rodgers ordered some of his men ashore, which included Puerto Rican volunteers, with the mission of posting the American Flag atop the lighthouse. On August 2, three more ships, the USS Amphitrite, USS Leyden, and the USS Hannibal arrived and joined the Puritan. The 25-man Spanish garrison stationed in the city became aware of the American presence and, after notifying their superiors in San Juan, were told to withdraw. When Dr. Santiago Veve Calzada, the mayor of the city, realized that the garrison was gone and that the city was defenseless against the invading Americans, he implored the Spanish authorities in San Juan to dispatch troops to defend his city. Believing that the Spanish forces would not come to his aid, Dr. Santiago Veve Calzada then went to the lighthouse to seek protection for the city from the Americans. On the afternoon of August 3, Dr. Veve Calzada entered the city with a contingent of Marines and the United States flag was hoisted over the Fajardo Customs House and City Hall. On August 4, Governor General Macias sent Colonel Pedro del Pino and 200 men to recapture the city. When Colonel Pino entered Fajardo he found it nearly deserted because the residents, fearing a battle, had fled to the Fajardo lighthouse. Pino waited until darkness fell and then ordered his men to attack the lighthouse. The Marines signaled the ships that they were under attack and the ships began to bombard the shore in a protective pattern. The Spanish forces retreated back to the city. The following day U.S. Marine Lieutenant John A. Lejeune came ashore with a detachment of Marines and evacuated the civilians and Marines for transport to Ponce, and the lighthouse was abandoned. Meanwhile, in the City of Fajardo, Pino's men tore down the United States flags that flew over the Customs House and City Hall and returned to San Juan after verifying that the lighthouse was abandoned, displaying the flags as his trophies of war. It was the only time that American forces were forced to withdraw from any position during the campaign in Puerto Rico. Puritan had a busy career in 1898 during the Spanish-American War. Assigned to the Cuban blockade in April, she joined New York and Cincinnati in shelling Matanzas on the 27th. After a stop at Key West in early May, she departed on the 20th to join the force building under Rear Admiral William T. Sampson that would eventually move against Santiago. Puritan linked up on the 22nd and Sampson moved his ships to Key Frances on the Nicholas Channel in order to execute his plan to contain the Spanish Fleet at Santiago. The success of Sampson’s squadron at Santiago on July 3 resulted in almost the complete destruction of the Spanish Fleet. After Cuba, she sailed for Puerto Rico where she landed a party of US Marines and shelled the Spanish positions at the Battle of Fajardo.